After years of using white gas stoves We're using our Trangia on an upcoming trip to the Broken Islands. I like the ease of use along with the nesting pot set. Can we use our old,clean MSR/Sigg bottles for carrying methyl hydrate? I thought there was some concern about the MH drying out the seals on the MSR type bottles. I see MEC in Canada sells a bottle for MH use. I've used Sigg fuel bottles for meths with no problems, except that the screw top seizes occasionally. I don't know why. But you don't need to use a fancy bottle to carry meths. I use PET bottles from fizzy drinks. This is one of the advantages of meths as a fuel - you can use very light containers and choose exactly the size and shape that suits. Additionally: Consumption? I can't remember if the daily requirement of fuel is higher with a MH stove due to the lower BTU output? Can anyone put a figure on it? Hugh, don't mention the war. This topic causes so much discussion: alcohol stoves are slower and yes, use more fuel, but when you're using them you shold aim to minimise fuel use, for example by using a pot cosy instead of simmering. 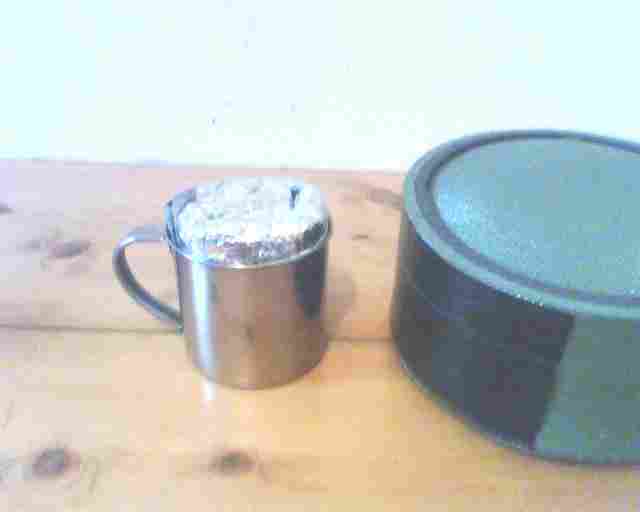 If you try to use an alcohol stove the same way you use an MSR type stove, you'll need gallons of fuel. when you're using them [alcohol stoves] you shold aim to minimise fuel use, for example by using a pot cosy instead of simmering. Nohoval, how effective is pot cozy? It is essentially a low-efficency Thermos. You can make a better tea in it, than in un-insulated teapot. Regular metal teapot starts cooling down immediately after you turn the heat off, and makes rather poor tea, compared to insulated plastic mug with lid (which I'm using outdoors) or even to regular thick-wall porcelain cup, which I use at home (Chinese shops have porcelain cups with lids for that purpose). If something requires 15-17 minutes of simmering, like rice or buckwheat, I doubt it can be "cooked" in pot cozy - perhaps this will work for the first few minutes only? Trangia on an upcoming trip to the Broken Islands. I like the ease of use along with the nesting pot set. Well...Compact LPG stoves like MSR pocket Rocket, Easy Fuel etc are easy to use (easier than alcohol stove), and they fit inside nesting pots like GSI aluminum pot set size 5" * 5", without a fuel canister - though some can fit even with a canister, but I don't like storing LPG canister inside the pot. I've been doing some research since I posted earlier. is not food grade. " Nohoval do you suggest PET bottles as in pop bottles here in North Am? "But you don't need to use a fancy bottle to carry meths. I use PET bottles from fizzy drinks. This is one of the advantages of meths as a fuel - you can use very light containers and choose exactly the size and shape that suits." I do have some anodized Sigg bottles somewhere so they may work. I once stored denatured alcohol in an msr bottle. It never leaked or seized. However after at least a season when I looked inside the bottle it was blistering under the paint. Nalgenes lexan bottles have worked well for me, if you go this route do not choose a shape you use for water. I bought a couple of all-plastic bottles specifically designed for carrying alcohol from REI. Might have beeen Trangia, actually. They have a nice pouring spout with a clever valve. The above Trangia bottle however can be sold. Nohoval, how effective is pot cozy? ... If something requires 15-17 minutes of simmering, like rice or buckwheat, I doubt it can be "cooked" in pot cozy - perhaps this will work for the first few minutes only? You'd be surprised. I cook rice this way, the quick-cook "Uncle Ben's" variety. I bring the water and rice to the boil and then take it off the heat, wrap it in a pot cosy and leave it 20 minutes. It's always perfectly cooked and piping hot. And this is with a very thin pot cosy made out of a cheapo sleeping mat. I have another, bulkier, cosy made out of a proper foam sleeping mat, and I can cook regular rice in 40 minutes or so. That's exactly what I'm suggesting. The Sigg bottles are nice, and that pouring spout from Trangia does work well, but it's a lot of extra weight for very little benefit. The PET bottles are cheap, strong, and come in a variety of sizes and shapes. They also come with free fizzy drink inside! Brasslite make some very nice lightweight alcohol stoves, and also sell a range of accessories, including these plastic dispenser bottles that allow you to measure out an exact quantity of fuel. I use 10ml for my porridge, and 20ml for my rice in the evening. 30 ml a day - about one ounce. 20 minutes.... And this is with a very thin pot cosy made out of a cheapo sleeping mat. I have another, bulkier, cosy made out of a proper foam sleeping mat, and I can cook regular rice in 40 minutes or so. Nohoval, what is thin and what is proper foam sleeping mat - in mm? (and what kind of foam - regular blue, or more dense yellow Evazote, or anything else)? 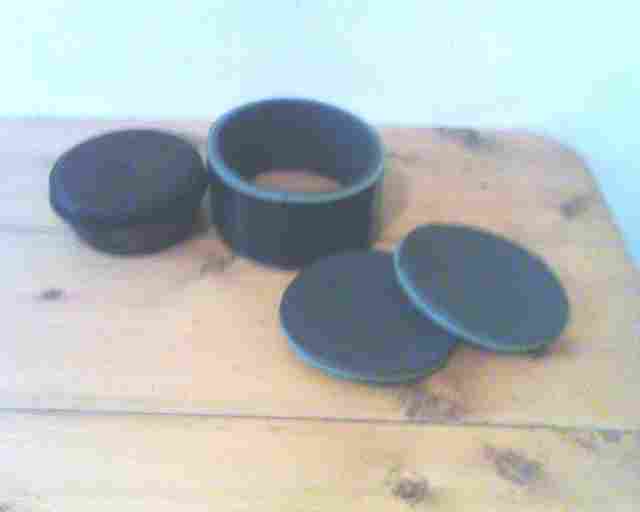 I took some photos of my pot cosy - apologies for the quality, but a phone camera is my only digital camera at the moment. 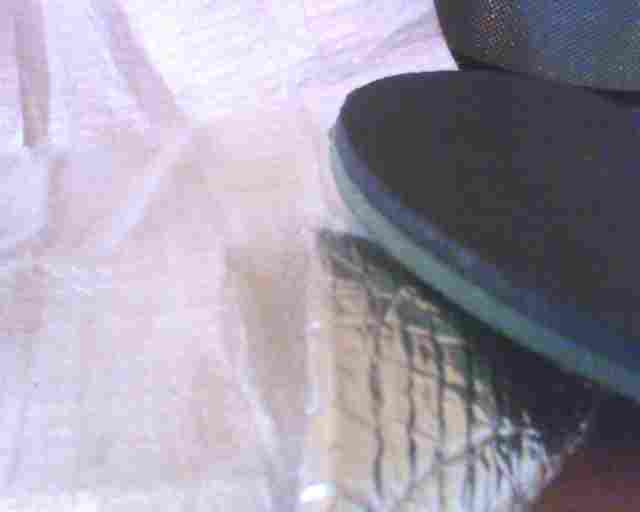 The foam one is the usual thickness of a foam mat - this one is 9mm. The drawback of the foam is that it is a lot bulkier - the only practical way to carry it is around the pot. But it is much more efficient. The thin one is much easier to carry - the photo above shows it folded into my mug. It's sold by Gelert as an "emergency sleeping mat", but I can find no mention of it on their web site. I wouldn't dream of sleeping on it - it's just a couple mms thick, being a layer of bubbled plastic backed with some sort of foil. But it's plenty good enough as a cosy. I haven't cut it to fit exactly, it's just the smallest square of the stuff that would still wrap a pot. I can't over-emphasise how much fuel these things save. You'll need to experiment to find out how they fit in with your cooking style, but mostly you'll never need to run your stove for longer than it takes to boil water. Your rice can be cooking in the cosy while you cook the rest of your meal. It's like having a second stove! I actually once tried burning meths in my whisperlight - it was a disaster. It reacted badly with the seal on the bottle too. I wouldn't recommend MSR bottles for alcohol. PET bottles actually store white gas very effectively too - just make sure they are well labled because it isn't purple like meths. I was also skeptical about the pot-cosy concept until I tried it. But, on a recent expedition to Mt Logan we just boiled water, poured it into a zip-lock bag which contained a meal for three, and placed this into a neoprene insulating bag. Since it was about -20C, this then went into a sleeping bag for about 10mins, and then was ready to eat. Quick-cook rice, couscous, fine pasta, noodles, powdered potatoes, porridge - all no problems. The stove just got used for turning snow into boiling water and as a bonus we only needed to carry one pot, and it never even needed washing.